A study led by researchers at Invitae has found that 23andMe’s direct-to-consumer BRCA test, which tests for three common variants in the BRCA1 and BRCA2 genes and is authorized by the US Food and Drug Administration, misses almost 90 percent of BRCA mutation carriers, both in those with and those without a personal or family history of cancer. In addition, it misses almost 20 percent of BRCA mutations in those of self-reported Ashkenazi Jewish descent because it doesn’t test for them. The results of the study, which looked at data from almost 125,000 de-identified individivuals who had been referred to Invitae for diagnostic testing with one of the firm’s cancer risk tests, was presented yesterday at the American College of Medical Genetics and Genomics annual meeting by Edward Esplin, a clinical geneticist at Invitae. Esplin told GenomeWeb that the study, which did not mention 23andMe by name, was meant to criticize a screening strategy with an FDA-authorized DTC test that appears to have limited clinical utility rather than to criticize 23andMe for offering the test. In his presentation, he pointed out that the FDA’s authorization for the test last year “sounds more like a warning than an approval.” FDA cautioned that the test, which examines three founder mutations in the BRCA genes that are common in the Ashkenazi Jewish population, does not assess more than 1,000 other known BRCA mutations, so a negative result does not rule out someone is a mutation carrier. It also advises that positive test results should not be used to determine any treatments without confirmatory testing and genetic counseling. 23andMe has been widely criticized for offering the test, and many experts have said that customers receiving a negative result may falsely assume they do not have an elevated breast or ovarian cancer genetic risk. The company has countered that it believes its customers do understand the limitations of the test and that many who receive a positive result may not have learned about it otherwise. 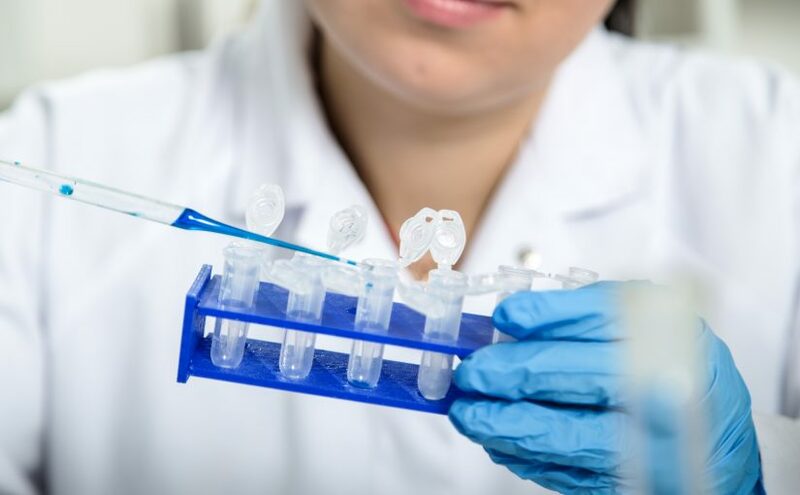 However, Esplin said, up until now, there has been no data available on the implications of a DTC strategy for breast and ovarian cancer risk testing that is limited to only three mutations. For their ongoing study, which involves clinical collaborators from the Dana-Farber Cancer Institute, Yale University, and Georgetown University, the researchers are planning to analyze data from more than 200,000 de-identified individuals tested by Invitae and to include clinical vignettes of patients they have seen. Yesterday, Esplin presented preliminary results from three cohorts totaling almost 125,000 de-identified persons who had undergone diagnostic cancer risk testing at Invitae for different reasons. Of these, 119,300 were referred for diagnostic hereditary breast and ovarian cancer genetic testing because of a personal or family history of cancer. The company offers a variety of cancer risk panels of different sizes that include the BRCA genes, and Esplin did not specify which of these panels were used in testing patients. Another 5,200 patients had undergone Invitae testing without a reported personal or family history of cancer because they had sought genetic testing to inform their own health. These included patients who had taken one of Invitae’s proactive health genetic tests, such as the Cancer Screen or the Genetic Health Screen. A third cohort consisted of 100 patients who were referred to Invitae for confirmatory testing after receiving a positive result on a DTC test from 23andMe and others. In the indication-based cohort, Invitae found that 11 percent had a pathogenic or likely pathogenic mutation in a hereditary cancer syndrome-associated gene, while 89 percent had a negative result. Of the more than 4,700 patients in whom Invitae found a pathogenic or likely pathogenic mutation in BRCA1 or BRCA2, only 12 percent had one of the three Ashkenazi Jewish founder mutations, while 88 percent had a different mutation. Those patients would not have obtained a positive result had they taken the limited 23andMe test, which is “clearly very concerning,” Esplin said. Within the BRCA-positive group, 94 percent of those who said they were not of Ashkenazi Jewish descent had a mutation that was not included in the 23andMe test. Even within some self-reported Ashkenazi Jewish individuals with a BRCA mutation, 23andMe would have delivered a negative result: 19 percent of them had a mutation other than the three founder mutations. Among the 5,000 or so “healthy” patients who underwent Invitae testing without a reported family or personal history of cancer – a group that might be more representative of the type of person seeking out 23andMe’s BRCA test because they would not be covered by current screening guidelines – the results were no different: only 12 percent of those who were found to have a mutation in BRCA1 or BRCA2 had one of the three mutations tested by 23andMe, and 88 percent had a different mutation. Finally, Invitae was only able to confirm a positive DTC result – many of them in BRCA1 or BRCA2 – for half of the 100 individuals who were referred to it for confirmatory testing. Esplin said this result is consistent with other data published last year and points to the potential for false-positive results from a DTC screening strategy. Overall, Esplin said, the data confirms the caveats contained in the FDA’s authorization of 23andMe’s BRCA test and suggests that confirmatory testing is needed for those with a positive result as well as those with a negative result from limited DTC testing. “Both of these types of individuals should receive clinical genetic testing,” he said. This article was published by GenomeWeb.